The presentation of the cheque (back row, from left): school head Joe Gauci, Andrew Decelis from Puttinu Cares, Noah Sammut. (Second row, from left) Faye Papagiorcopulo, Inez Azzopardi, Sarah Mifsud, Maisie Camilleri Preziosi and Luisa Borg. (Front row) Philippa Axisa, Sean Grech, Emily Ellul Mercer, Nina Gauci. Absent: Gaia Micallef and Yazmin Zammit. 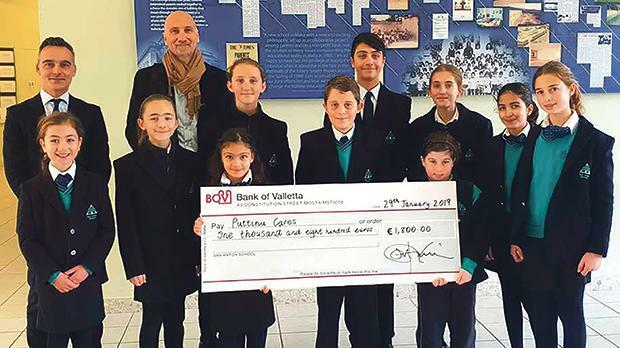 Students who had designed San Anton School’s Charity Christmas Cards recently presented the proceeds from the sale of their cards, amounting to €1,800, to Dr Andrew Decelis, a representative of Puttinu Cares. The students’ artwork was selected in a rigorous process following a Christmas card design competition across the whole school. A set of 12 Christmas cards were then professionally printed thanks to a generous benefactor and to Inserv Ltd, who sponsored the packaging, All the proceeds from the sale of the cards went to Puttinu. This was the school’s first ‘30 ways of Giving’ initiative, which will see the school carry out 30 charitable and environmental activities throughout this scholastic year in celebration of its 30th anniversary.